Received an email today from the Twoo dating site that I had a SmartMatch with a guy from London. Wahoo, so exciting to see who I was Twoo SmartMatched with, hope he’s hot!!! I better check my Twoo SmartMatch out sharpish then, don’t want to miss out on a real hotty from London! Then I realize, I’m no where near London (about 150 miles away), I’m not aged 19 to 29, I’m not even a woman and probably more important than that (you never know, Sergey might swing both ways) I never joined the dating site Twoo! In fact I’ve NEVER joined any dating site, I’ve been very happily married for over 25 years and have no interest in meeting a potential partner: for the record I’ve also not joined any site/service that’s designed to meet other people (people in person) beyond social media networks like Facebook, Twitter, Google+, LinkedIn etc… which are not for meeting people in person per se. Hmm, I’m registered on a dating site without my permission and I’m receiving dating matches with men. Wonderful! Since I never signed up to the Twoo dating site I obviously didn’t have a Twoo login password, but I wanted to see what info they held about me. I used the password reminder form to generate a new password and logged in. Based on my Twoo profile they have my Gmail email address and my first and last name. 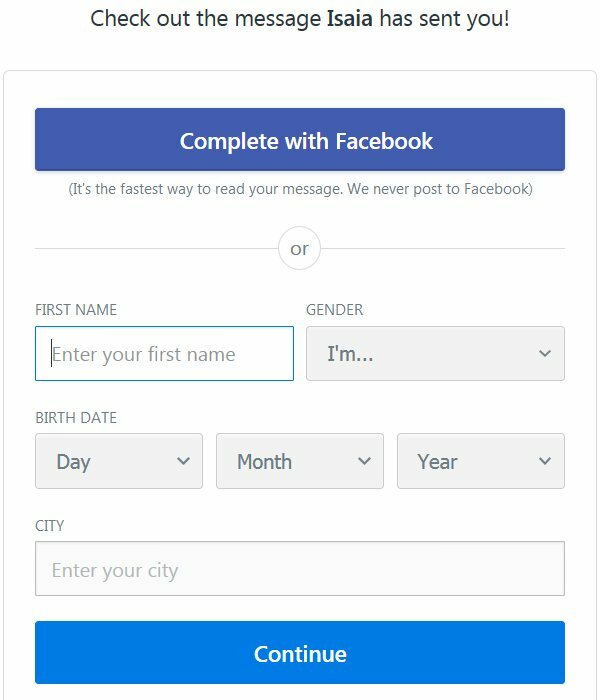 No profile image, no gender, no date of birth, no city listed. 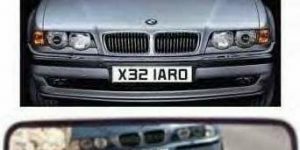 What appears to have happened is Twoo have scrapped my Gmail email address and name from one of my email contacts address book. 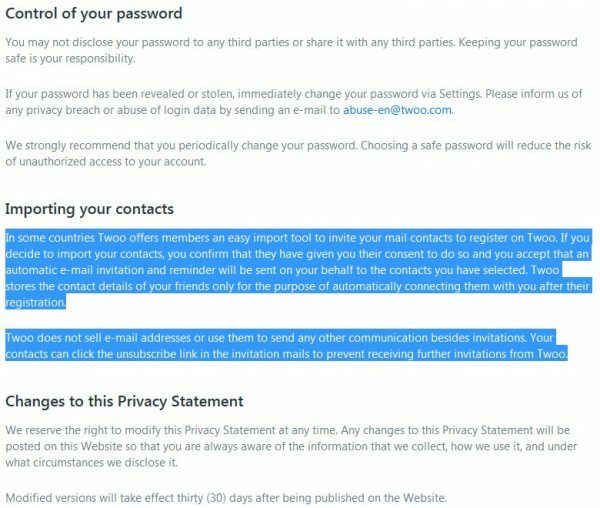 In some countries Twoo offers members an easy import tool to invite your mail contacts to register on Twoo. If you decide to import your contacts, you confirm that they have given you their consent to do so and you accept that an automatic e-mail invitation and reminder will be sent on your behalf to the contacts you have selected. Twoo stores the contact details of your friends only for the purpose of automatically connecting them with you after their registration. 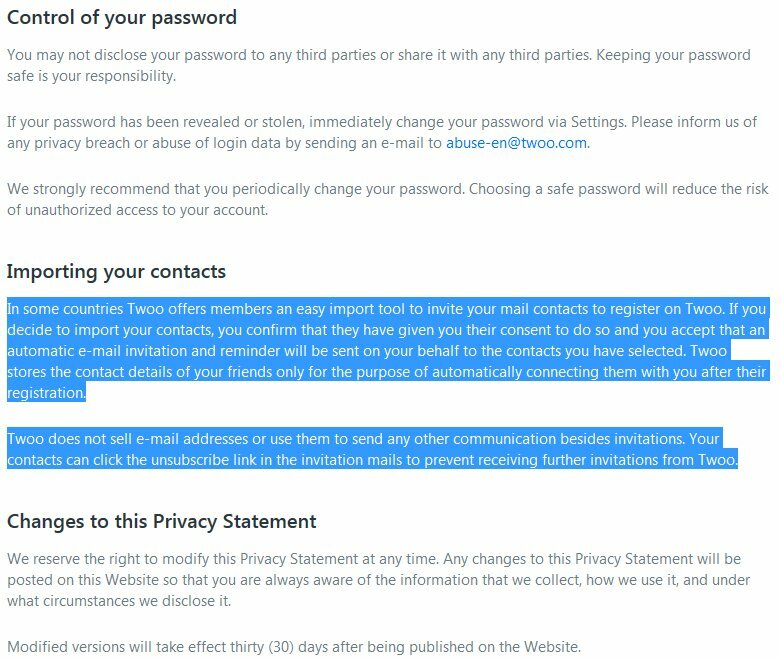 Twoo does not sell e-mail addresses or use them to send any other communication besides invitations. 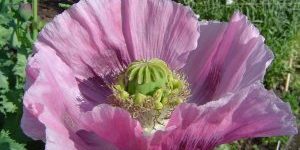 Your contacts can click the unsubscribe link in the invitation mails to prevent receiving further invitations from Twoo. Hmm, what a load of BS. As if a user is going to check with all their email contacts and gain consent! For the record none of my email contacts have acquired my permission to be contacted by Twoo. 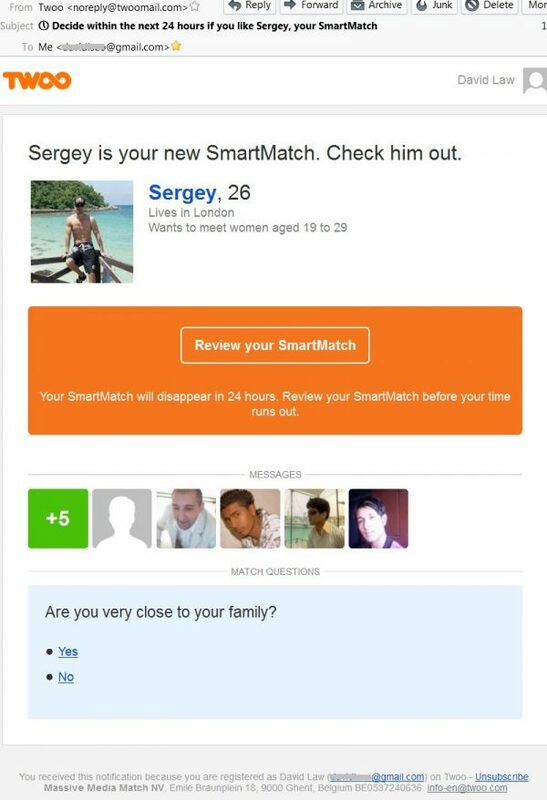 I think sending me a Twoo SmartMatch with 26 year old Sergey from London is way beyond an email invitation to join the dating site. Twoo registered my email address with their service, (if I wasn’t registered the Password Reminder wouldn’t have worked) and are sending me their SmartMatches. Twoo are a bunch of scumbag SPAMMERS. It’s bad enough that Twoo scrape data this way, but to automatically sign people up to their dating service is an unacceptable business practice. Time to look into what sort of complaint I can make about Twoo’s business practices in the UK. Twoo is the most fun way to meet new people near you. With over 13 million monthly active users*, Twoo is the largest site to meet new people. Twoo is available in over 200 countries and in 38 languages. Will I be considered an active user because I logged in to find out why they signed me up without permission! Based on their shady business practices it wouldn’t be surprising to find out most of their active users are fake accounts. Every day, over a million new connections are made between real people on Twoo. Whether you fancy chatting, searching, sharing photos or meeting people easily, Twoo is full of exciting people! I wonder if the millions of new connections are people like me who have been registered without permission! Never miss a beat with the Twoo iPhone, Android and Windows Phone apps. Check out our mobile site or install our browser and desktop plugins to stay up to date with all activity on your profile. 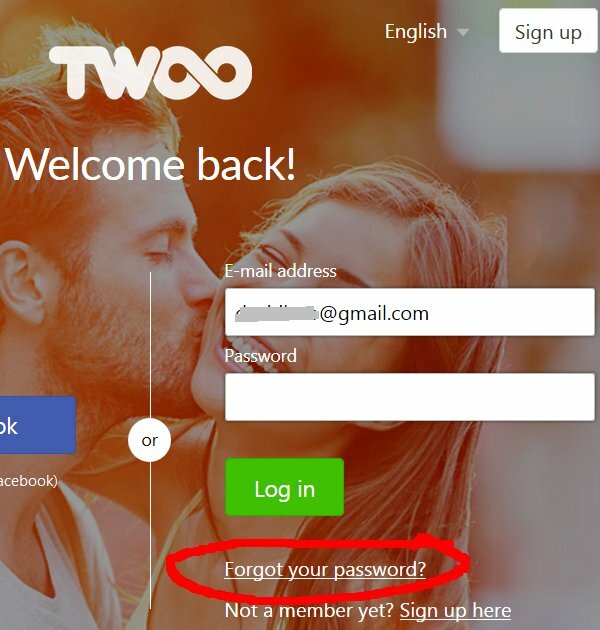 But I didn’t sign up to Twoo in the first place, I don’t want it on my phone or my Desktop PC! If this has happened to you, feel free to make a comment below. David Law : Happily married, not looking to meet anyone.